No this time not real ones thankfully – we having lots of wet rather than snow at the moment. 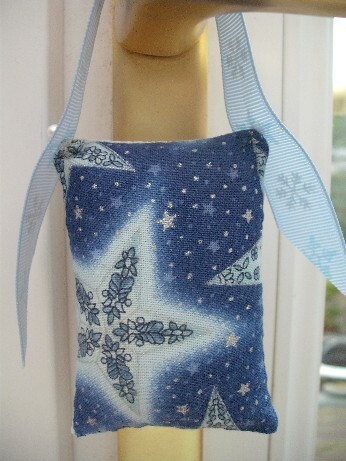 I have just finished the first of my winter ornies for my ‘decorate my house collection’. 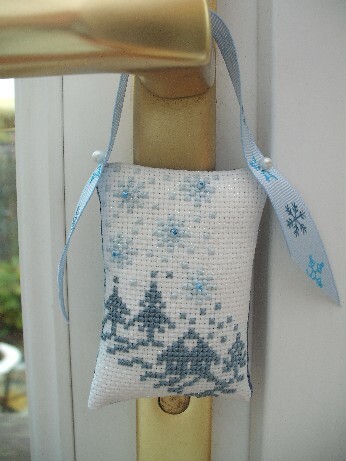 I have adapted the JBW stocking design that I did in red for the Xmas tree and made it into a little hanging pillow to complement the snowflake stickers on the conservatory doors. I chose to stitch it in two different Silk Mill blues to go with some very lovely fabric that I have had in my stash for a couple of years. I am pleased with the way it turned out though could have made it a little bigger as it is not that obvious that it is a stocking shape as the edges got hidden once I stuffed it. 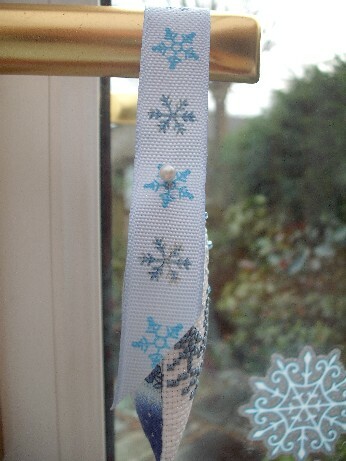 However I do love the way it co-ordinates with the ribbon (that again has been in the stash for a while). 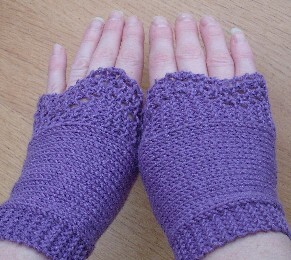 I have also finished the set of Lilac Sublime Wristwarmers and am half way through a pair for me. This was the second attempt at these. They are from Ravelry – a free pattern called Blonde Wristwarmers. The original pattern had garter stitch for the main part and I changed that to stocking stitch but when I had finished the first one it was too loose around the wrist so I re-did it on smaller needles and added a 6 stitch garter stitch band at the wrist edge – because the whole thing is knitted sideways it acts like a rib. I also shortened them. My finished pair was knitted with 30 stitches on 3.5 mm needles with the last 6 stitches on alternate rows as knit rather than purl if you want to adapt the pattern as I have done. I am very pleased that I managed to adapt the pattern so much and to re-do it. I have got a lot more confident with my knitting and now understand more of the technical side which makes it easier to visualise what a pattern will look like. 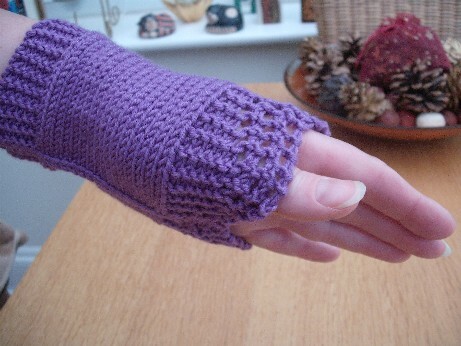 I particularly like the points or waves at the wrist on these and think I will be knitting a few more of these. When I get time that is – term has started again and I have been ridiculously busy – I have been working all weekend (which I really try not to do but I have a large pile of marking to get done!) I did make my evening knitting group this month but only for 3/4 hour due to having to work late and have not made any of my other groups for ages 😦 Thankfully I really enjoy my job and have a great time doing it but do wish it left more time for crafting. My new quilt cutting mat and ruler arrived on Thurs but I have not had time to play with them yet – maybe next weekend. Well I do hope you have all had a good week and thanks for visiting.